In North Dakota and Montana, the first snow of the season has arrived, but on the East Coast the temperatures will reach up into the 80s. NBC's Brian Williams reports. A rare early October snowstorm dumped snow across parts of Minnesota and North Dakota, including 14 inches in one Minnesota county, snapping tree lines and cutting power to residents who worked to dig out and clean up on Friday. Some areas saw record amounts for this early in the season, the National Weather Service said in an advisory. Grand Forks, N.D., was among them -- getting 3.5 inches by Thursday afternoon. The previous Oct. 4 record for the city was 2 inches in 1950. "For early October, this is definitely a big storm," Jeff Makowski, a weather service meteorologist based in Grand Forks, told Reuters. Near-blizzard conditions were blamed for a head-on collision that killed a woman, the Grand Forks Herald reported. Minnesota's Roseau County saw the most snow by Thursday afternoon -- 14 inches. The county is in the state's northwest corner, near the border with Canada. Six inches of snow were reported in Karlstad, Minn., where residents had been forced from the city temporarily this week by a wildfire that burned several homes and other structures. 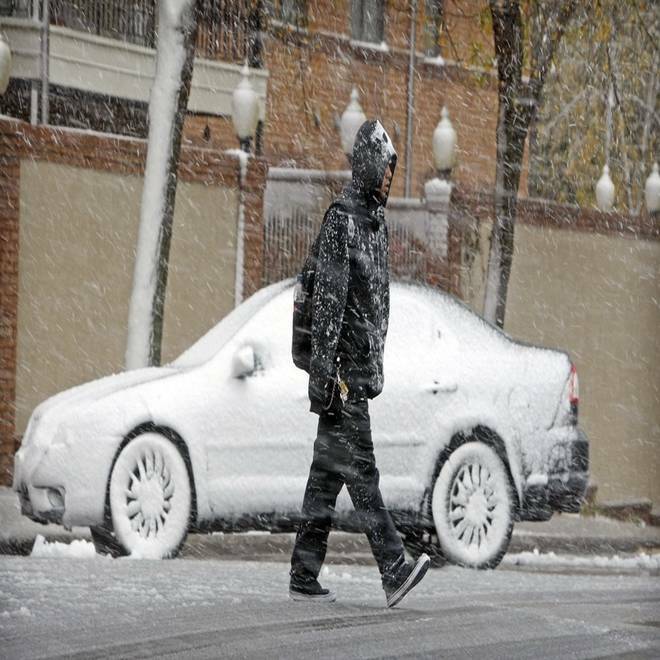 Snow falls Thursday in Fargo, N.D., which saw an inch by the afternoon. Northern Minnesota and North Dakota have seen several years where snow fell in the second half of September, the weather service reported. The region had seen unusually warm temperatures earlier in the week -- including Monday's high of 80 degrees in Grand Forks. Video: Could Border Patrol agent's death have been friendly fire?